The leek, Allium ampeloprasum var. porrum, also known as Allium porrum, is a vegetable which belongs to the same family as onions and garlic. In Greek ampel means a grape vine and pras means leek, resulting in epithet—the leek of the vineyard. Dried specimens, wall etchings and textual fragments at archaeological sites in ancient Egypt and Mesopotamia have led to the conclusion that leeks were cultivated as a food source from the 2nd century B.C.E. As a national emblem of Wales it is worn on St. David’s Day, the patron saint of the region. 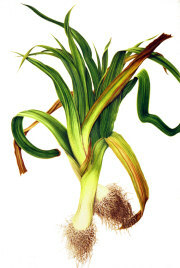 Reference to the ancient tradition of wearing a leek to signify a soldier’s Welsh identity occurs in Shakespeare’s Henry V; and even today the leek appears on the badge of the Welsh Guards, a regiment of the British Army. The “stalk” of the leek consists of bundled leaf sheaths forming a long cylindrical shape instead of the tight bulb of its cousin, the onion. It is less pungent than onions, with its own distinctive, more subtle taste—a favorite vegetable from modern-day Latvia to ancient Rome where the Emperor Nero relished its flavor in his soup, believing that leeks improved his voice. © 2008 – 2014, milly acharya. All rights reserved.